Kathleen was delighted by the wonderful crowd that came for her Chloe Ellefson Mysteries program, yesterday evening in the Quad Cities. The event was sponsored by the Hampton (IL) Historical Society, the Center for Belgian Culture (Moline), and the Midwest Writing Center (Rock Island). Kathleen thanks the sponsors and all those who attended. This was her first visit to the Quad Cities and she had "loads of fun!" During this week's Quad Cities visit, Kathleen was interviewed by Don Wooten and Roald Tweet, the delightful hosts of WVIK radio's weekly Scribble program. They talked about her Chloe Ellefson mysteries, The Lacemaker's Secret, and writing and getting published. Their conversation will be broadcast and released as a podcast on May 11th. You are invited to join Kathleen for a richly illustrated 'behind the scenes' tour of her award-winning nine book Chloe Ellefson mystery series—including the newest story, The Lacemaker's Secret, about Belgian-American pioneers, and a 'sneak peek' at the next Chloe story! Kathleen will also share how working at Old World Wisconsin influenced her Chloe character, how her research into police work helped shape Chloe's love interest, officer Roelke McKenna, and how she crafts their stories. Kathleen will also answer audience questions, award door prizes, and sign books (copies will be available for purchase). This free, hour-long public event is co-sponsored by the Hampton Historical Society, the Center for Belgian Culture in Moline, and the Midwest Writing Center in Rock Island. Kathleen's program begins at 7:00 PM, Tuesday, April 23rd, at the Hampton United Methodist Church, 400 2nd Avenue, in Hampton, Illinois. Kathleen recently received this sweet message from Nancy A. on Facebook. "We thought you were writing just for us because your [Chloe Ellefson] books are so personal and specific to places we love." Despite rain, snow, sleet, high winds, and thunderstorms—they came. Eighteen hearty souls braved the bomb cyclone last night to attend Kathleen's Chloe Ellefson Mysteries program at the Belleville Public Library. Thanks to everyone who came, and to the librarians and the friends of the library for sponsoring the event. The Village of Belleville (pop. 2,425) clearly supports their library; first established in 1894, it will move into a new 13,805 square foot Library and Community Center in 2020. This week's favorite reader review of the ninth Chloe mystery, The Lacemaker's Secret, was posted by tl on Amazon.com. "I loved this book. The way the author combines fiction and history makes the Chloe Ellefson series some of the best books I have ever read. This time I learned about the Belgian people who settled in the Green Bay area. I even you tubed some videos of Bobbin Lace making to see what it was all about and was amazed at the talent of people who still do this work! As usual, I'm anxiously awaiting the next one!" Chloe's Coming to Belleville - Tomorrow! The public is invited to join Kathleen for a richly illustrated 'behind the scenes' tour of her award-winning, Wisconsin-based Chloe Ellefson mystery series. The program will include a special focus on her newest book, The Lacemaker's Secret, set in Green Bay and Door County—plus a brief reveal of the upcoming tenth Chloe mystery! This free hour-long event is co-sponsored by the Friends of the Belleville Public Library and begins at 6:30 PM, Thursday, April 11th, at the Public Library in Belleville WI. Last night at the Waupun Public Library Kathleen enjoyed an hour with an avid group of readers—some of whom were unfamiliar with the Chloe Ellefson mysteries. Stories were shared, door prizes awarded, and books purchased. It was a fun evening. Special thanks to Pamelyn Garcia and her staff, and to the Friends of Waupun Library. Patricia Skalka, award-winning author of the popular Dave Cubiak Door County Mystery series, has written this about Chloe 10. "Fiddling with Fate is a story about proud, strong women and bitter dark secrets. In her richly-detailed and multi-faceted mystery, Kathleen Ernest skillfully intertwines the past with the present as Chloe Ellefson searches for her family roots in Norway amid escalating danger." Fiddling With Fate comes out September 8th from Midnight Ink. It can be ordered now in trade paperback and multiple ebook formats. Chloe's Coming to Waupun - Tomorrow! This free hour-long event is co-sponsored by the Friends of Waupun Public Library and begins at 6:30 PM, Tuesday, April 9th, at the Waupun Public Library in Waupun WI. The first edition of the first book in the Chloe Ellefson mystery series is now in its eighth printing since it was first published eight years ago. Kathleen discovered this delightful post by dog and cat mom. "I've read all of the Chloe Ellefson mysteries and am always looking forward to when the next book comes out. ...If you like historical fiction and cozy mysteries, you will love this series." The Council For Wisconsin Writers has named Kathleen winner of their 2019 Major Achievement Award honoring the work of a Wisconsin writer who deserves special recognition for their literary merit. Past winners of the Major Achievement Award include such noted Wisconsin writers as Jerry Apps, Norbert Blei, Jane Hamilton, Kevin Henkes, and John Nichols. In previous years the Council has individually honored two of Kathleen's Chloe Ellefson adult mystery novels, The Heirloom Murders and Mining For Justice (Midnight Ink), and five of her children’s books: Meet Caroline (American Girl), Hearts of Stone (Dutton), Betrayal at Cross Creek (Pleasant Company), and Retreat From Gettysburg and Ghosts of Vicksburg (White Mane). 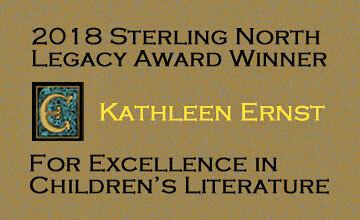 The Major Achievement Award comes on the heels of Kathleen winning the Sterling North Legacy Award for Excellence in Children’s Literature and being named a Notable Author by the Wisconsin Library Association. Kathleen will be receive her award at the Council's annual banquet on Saturday, May 11th, at the Wisconsin Club in Milwaukee. Today Kathleen wrapped up her last major edits to the Chloe 10 manuscript. The book's Acknowledgements, Author's Note, Cast of Characters, and Dedication are still to be written. Later she will give the the final version a light review for typos, etc., before publisher Midnight Ink sends Fiddling With Fate to the printer. As of today, all is on-track for the story's release this September 8th in trade paperback and multiple ebook formats. You are invited to join Kathleen for a richly illustrated 'behind the scenes' tour of her award-winning nine book Chloe Ellefson mystery series—including the newest story, The Lacemaker's Secret, about Belgian-American pioneers and a 'sneak peek' at the next Chloe story! This week's favorite reader review of the ninth Chloe Ellefson mystery, The Lacemaker's Secret, was posted on NetGallery by Susan G., an educator. 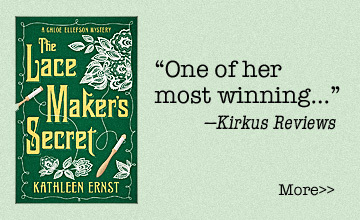 "The Lacemaker's Secret is a rare gem in the world of cozy mysteries. Part historical fiction, part mystery, but full of a unique storyline that keeps readers guessing at each and every page." You are invited to join Kathleen for a richly illustrated 'behind the scenes' tour of her nine book, award-winning, Wisconsin-based Chloe Ellefson mystery series—including the newest story, The Lacemaker's Secret, and a 'sneak peek' at the next Chloe story! Kathleen will also share how her years working at Old World Wisconsin influenced her Chloe character, how her research into police work helped shape Chloe's love interest, officer Roelke McKenna, and how she researches and writes their stories. And Kathleen will answer audience questions, award door prizes, and sign books (copies will be available for purchase). This free, hour-long public event is sponsored by the Friends of the Belleville Public Library in honor of National Library Week. Kathleen's program begins at 6:30 PM, Thursday, April 11th, at the Belleville Public Library. Large Print Giveaway - Winners! The winners of Kathleen's Large Print Giveaway are DIANNE MARTINAGANO, MIRIAM R. NELSON, and KATHLEEN NEWBERG! Each gets an author signed, personalized, large print hardcover of The Lacemaker's Secret, the ninth and newest mystery in the award-winning Chloe Ellefson series. "...a wonderful trip to take." Kathleen received this delightful message from Eileen in Cape Cod, MA, who describes herself as "a semi-retired librarian." "Thank you for another Chloe Ellefson mystery. ...Thank you also for your research, your historical fiction is so enlightening. I am a New Englander and reading about Wisconsin is such a wonderful trip to take." To celebrate tomorrow's release of a large print hardcover edition of her ninth Chloe Ellefson mystery, The Lacemaker's Secret, Kathleen is giving away three signed and personalized copies! To enter, leave a comment on the giveaway post on her Facebook Author page or her Sites And Stories Blog before 11:59 PM (Central US time), this Wednesday, March 27, 2019. One entry per person, please. The winners will be chosen at random and announced the next day—here and on her Facebook and blog pages! You are invited to join Kathleen for a richly illustrated 'behind the scenes' tour of her nine book, award-winning, Wisconsin-based Chloe Ellefson mystery series—including the newest story, The Lacemaker's Secret, and a 'sneak peek' at the upcoming tenth book. And Kathleen will answer audience questions, award door prizes, and sign books (copies will be available for purchase). This free, hour-long public event beginning at 6:30 PM, Tuesday, April 9th, at the Waupun Public Library in Waupun WI. This afternoon Kathleen and Mr. Ernst visited Reader's Realm, a beautiful independent bookstore in Montello, WI. Thanks to all who came, and to owner Kathleen Ludden for the invitation. Expect a return this fall—after Chloe 10, Fiddling With Fate, comes out! Lacemaker's is also available for the Kindle and other e-readers. Today Kathleen finished making her edits to the Fiddling With Fate manuscript in Oregon WI at Firefly, her "new favorite coffeehouse." Next she'll work through the comments coming from the story's editors and content experts. Kathleen must send the latest, near-final version of the book to publisher Midnight Ink by April 1st. "So glad I spotted this book..."
This week's favorite reader review of the ninth Chloe Ellefson mystery, The Lacemaker's Secret, was posted on Goodreads by Mary from southwest Ohio. "I don't know which I enjoyed more the present day story and characters, the past story and characters, or the story of the the lace. These three intertwined stories made for a great read." 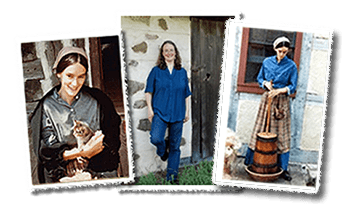 Meet Kathleen, bestselling author of the award-winning Wisconsin-based Chloe Ellefson Historic Sites mystery series, and get an autographed copy of any of her nine Chloe stories, including the newest, The Lacemaker's Secret, set in Green Bay and Door County, WI. Ask her about the next Chloe book, which is set for release this September. This free public signing will run from 1:00 to 3:00 PM, this Sunday, March 24th at the Readers Realm Bookstore in Montello, WI. This was Kathleen's 'work space' today at Real Coffee at Daun in Evansville WI. She was there editing the manuscript of her next Chloe Ellefson mystery, Fiddling With Fate. Kathleen wishes to thank the Sons of Norway Skjold Lodge in Palatine, Illinois and the fifty-plus people who came to hear her Chloe Ellefson mysteries program yesterday. Kathleen—a Swiss/Scottish/Dutch-American—had a delightful time discussing Norwegian Heritage with the Sons of Norway at the local Ukrainian Center on St. Patrick's Day! Yesterday Kathleen and Mr. Ernst attended a great presentation by Hardanger Fiddle maker Karen Rebholz. She spoke about these traditional Norwegian instruments, named for the Hardanger Fjord area in Norway, and about studying with a master fiddle maker in Voss. Her program took place at the wonderful Livsreise (Life's Journey) Norwegian Heritage Center in Stoughton, WI. The Sons of Norway Skjold Lodge invites the public to join them for Kathleen's richly illustrated 'behind the scenes' tour of her award-winning Chloe Ellefson Historic Sites mystery series. The program will include a special focus on Chloe's Norwegian-American heritage—plus a brief reveal of the upcoming tenth Chloe mystery! Door prizes and a book signing (copies will be available for purchase) round out this free, hour-long event—which begins shortly after 2 PM, March 17th, at the Ukrainian Center in Palatine IL. Kathleen was just named a 2018 All Star Award Winner for email effectiveness by Constant Contact, which provides email marketing services to 5 million small businesses and non-profits. This is the seventh consecutive year she has earned this honor. Less than five percent of Constant Contact customers are multi-year All Star Award recipients. 15 Days in Top 1% - Based on Pre-Orders! The public is invited to join Kathleen for a Norwegian-American version of her richly illustrated 'behind the scenes' tour of the award-winning Chloe Ellefson mystery series. This free public program is sponsored by the Sons of Norway Skjold Lodge and will include a brief reveal of the upcoming tenth Chloe mystery—set in Norway! Kathleen will share how her years working at Old World Wisconsin influenced her Chloe character, how her research into police work helped shape Chloe's love interest, Roelke McKenna, and how she researches and writes their stories. Door prizes and a book signing (copies will be available for purchase) round out this hour-long event that begins shortly after 2:00 PM, Sunday, March 17th, at the Ukrainian Center in Palatine IL. Port Washington - Great Group! Kathleen was delighted with the warm welcome she received yesterday in response to her Chloe Ellefson mysteries program. This free public event was made possible by the W.J. Niederkorn Public Library and the Port Washington Adult Community Senior Center. Thanks to both organizations—and all the wonderful Chloe fans who attended! This free hour-long event is co-sponsored by the Adult Community Senior Center and begins at 10:30 AM, Friday, March 8th, at the W.J. Niederkorn Public Library. Fiddling With Fate - Revealed! Posted March 3, 2019 on the Sites And Stories blog. Kathleen received this delightful message from Jan H. in Illinois who wrote about how she and her sister learned of the Chloe mysteries from their dental office receptionist. "We started in September with book one and are anxiously awaiting the new one coming out!! Really enjoyed all of them, but especially the last one on lacemaking [The Lacemaker's Secret]. We are both avid crocheters, knitters, and sewers... The book on the Civil War [A Memory of Muskets] was also one of my favorites and my sis liked the one on the flour factory [Tradition of Deceit] . Hopefully, we can visit the areas mentioned in the book this summer on some girls only trips." Chloe 10 - Off to the Publisher! Kathleen is feeling so comfortable with the manuscript of her tenth Chloe Ellefson mystery that she just sent it to publisher Midnight Ink—a day before the deadline! And now you can read a 'sneak peek' of the story's opening paragraphs by clicking HERE. This week's favorite reader review of the ninth Chloe mystery, The Lacemaker's Secret, was posted on Goodreads by Fred, a cozy fan from northeast Indiana. "A wonderful addition to this very exciting series. It is well-plotted and well written with wonderful characters. I will be watching for the next book in this series." This coming Friday, March 1st, is the publisher's deadline for Kathleen to turn in the manuscript for her tenth Chloe Ellefson mystery. All chapters are written and the story is close to its target of 95,000 words, but a few historical details still need to be checked and a review for typos completed. The book is set to come out September 8th! Posted February 22, 2019 on the Sites And Stories blog. The public is invited to join Kathleen for a richly illustrated 'behind the scenes' tour of her award-winning, Wisconsin-based Chloe Ellefson mystery series. This free program will include a special focus on her newest book, The Lacemaker's Secret, set in Green Bay and Door County—plus a brief reveal of the upcoming tenth Chloe mystery! Kathleen will also share how her years working at Old World Wisconsin influenced her Chloe character, how her research into police work helped shape Chloe's love interest, Roelke McKenna, and how she researches and writes their stories. Door prizes and a book signing (copies will be available) round out this hour-long event that begins at 10:30 AM, Friday, March 8th, at the W.J. Niederkorn Public Library in Port Washington, WI. "Warning: book series can be addicting." Teresa R. recently posted this sweet note on Kathleen's Facebook Author page about her experience reading the Chloe Ellefson mysteries. "Symptoms include going to bed early to squeeze in another chapter and researching the locations referenced for the next road trip. Side effects include buying a copy of Old World Murder for daughter who happens to live in Waukesha County." "What is the title of your newest book? How many books have you published?" Posted February 19, 2019 on the Map Your Mystery blog. Kathleen took this photo of her 'work space' at the coffee shop where she has been reviewing the manuscript of her tenth Chloe Ellefson mystery. She finished writing the story earlier this week, and is now busy smoothing rough prose, confirming historical details, and editing it down to about 95,000 words. Kathleen will remain at this until she sends the manuscript to Midnight Ink on February 28th. Another mocha, Kathleen? "A fellow librarian introduced me to..."
Taryn wrote about the Chloe Ellefson mysteries on Kathleen's Sites And Stories blog. "A fellow librarian introduced me to the Chloe series about 3 years ago. I read the first and was hooked. I thoroughly enjoy the characters, the stories and the way history is seamlessly woven into the plots." This afternoon Kathleen switched from writing Chloe 10 to teaching her Food Traditions writing workshop at Write On Door County. It filled up in advance and almost everyone was able to get there—despite the frigid temps! Kathleen says it was a great (and hardy) group and that she had a wonderful time with them. This week's favorite reader review of the ninth Chloe mystery, The Lacemaker's Secret, was posted by T. DeGuelle of Wisconsin on Amazon.com. "This was an excellent representation of the local area and history of the Door/Brown County area. As a lifetime resident and being of Belgian heritage, I felt she did a fantastic job of representing the culture. It accurately represented the Belgian faith and customs. She tied a mystery of the missing Belgian lace into the story. The characters were strong, faithful, hard working and kind. The book accurately describes the struggles they endured." Kathleen sent this wintery scene photo, taken on her Chloe 10 writing retreat this week. The snow proved too deep for the contemplative walk she attempted, but Kathleen says the peaceful setting is helping her get lots of writing done. Fly fingers, fly, Kathleen! Kathleen just departed for a week-long solo winter writing retreat. She will use the time for researching, writing, and editing the manuscript of her tenth Chloe Ellefson mystery. It is due into publisher Midnight Ink at the end of this month—for release on September 8th. Fly fingers, fly, Kathleen! The winners of Kathleen's 9 Book Lacemakers Giveaway are JACKI BEDWORTH, SUE GALLAGHER, KAY JOHNSON, KAREN MAYERS, HOPE MCLEOD, CINDY PATTERSON, LINDA ROEHRIG, BETH ROGERS, and MARGARET WURTH. Congratulations! Each gets an author signed, personalized, trade paperback of The Lacemaker's Secret, the ninth and newest mystery in the award-winning Chloe Ellefson series. Each winner should immediately contact Kathleen with their signing, personalization, and postal mailing information by clicking HERE. Kathleen is giving away nine trade paperback copies of her ninth Chloe Ellefson mystery: The Lacemaker's Secret. To enter, leave a comment on the giveaway post on her Facebook Author page or her Sites And Stories Blog before 11:59 PM (Central US time), Wednesday, January 30, 2019. Only one entry per person, please. The winners will be chosen at random and announced the next day, here and on her Facebook and blog! Posted January 25, 2019 on the Sites And Stories blog. "I normally don't read mysteries..."
This arrived recently from Ginny Nelson in Wisconsin. She wrote about how her great-great-grandparents escaped the Great Fire of 1871 by hiding in a field as flames surrounded their farm and consumed their home. "As far as I know, none of my Belgian ancestors made lace, but otherwise the early settlers [in The Lacemaker's Secret] could have been my relatives. ...you nailed the Belgian history in Wisconsin!" Foodways Writing Workshop - Register Now! This week's favorite reader review of The Lacemaker's Secret was posted by D. Zendel of New Mexico on Amazon.com. Posted January 22, 2019 on the Sites And Stories blog. Good news for mystery book discussion groups! Kathleen just posted a Discussion Guide for her newest Chloe mystery. Download a free copy from The Lacemaker’s Secret page—or by clicking HERE. Posted January 8, 2019 on the Sites And Stories blog. This arrived yesterday from Ann Thomas in Massachusetts. "Just finished Lacemaker's Secret and loved it. You bring so much history into your books that I am always learning about fascinating characters. This recent book really kept me guessing! I will be 86 in a few weeks, and have read your previous Chloe adventures. Looking forward to the next!" Each page on this website has a Contact link leading to a form that can be used to sent Kathleen a message. Yesterday she was shocked to learn that during the last six weeks all those messages sent to her were lost—before she received them—and cannot be recovered. One of the joys of being an author is hearing from readers, and Kathleen is very conscientious about replying to the messages she gets. If you sent her a message anytime between 11/24/2018 and 1/5/2019, she asks that you please resend it using her now repaired message form. Thank you. From reader Paul Bunyan comes this review of The Lacemaker's Secret. "Kathleen Ernst is a fabulous author. Her stories make me want to jump in the car and visit the historical sites."